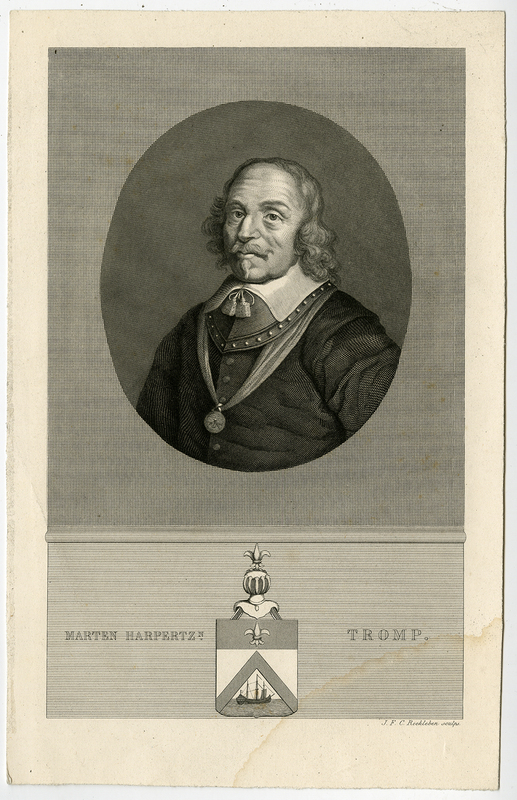 Subject: Antique print, titled: 'Marten Harpertzoon Tromp.' - The portrait of the Dutch Admiral Maarten Harpertzoon Tromp. Condition: Very good, given age. Stain in right lower. Some small stains. General age-related toning and/or occasional minor defects from handling. Please study scan carefully. Medium: Steel engraving on wove paper. Size (in cm): The overall size is ca. 16.2 x 25.5 cm. The image size is ca. 13.8 x 22 cm. Size (in inch): The overall size is ca. 6.4 x 10 inch. The image size is ca. 5.4 x 8.7 inch. Description: This old antique print originates from: 'Algemeene geschiedenis des Vaderlands van de vroegste tijden tot op heden. ', in 14 volumes by J.P. Arend (continued by O.van Rees, W.G.Brill, J. van Vloten), published in Amsterdam, by a.o. J.F.Schleijer, 1841-1879. Artists and Engravers: Made by 'J.F.C. Reckleben' after an anonymous artist.